First of all, a very Merry Christmas and Best Wishes to all for the New Year, Health and Peace . Only a few months before our 9th Meeting in PNG. Our Host, Bob Bates has prepared for us some 'pre' and 'post' meeting Tours for those interrested to see more of this marvellous country. Once again, all the very best for 2016. 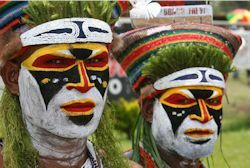 Hope to meet you all in Mount Hagen.